Make your action pop with some of our props HERE! 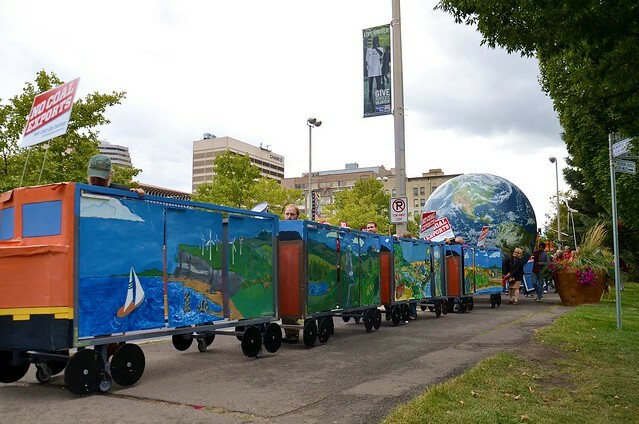 From inflatable oil pipelines, to a 12ft globe, and vulture capitalists puppets, to Overpass Light Brigade LED light panels for activist scrabble, we’ve got props! Fellow artists and activists have joined forces to create colorful imagery that have added an element of spectacle and theater to our actions over the years. Now, we’re making some of our favorites from our collection of imagery and puppets available to you and your community to borrow. Make your action pop with some of our props HERE!! Deploy Baby Trump in Your City! Like you, we were super inspired by the UK artful activists who designed and deployed the BabyTrump. We got in touch with the Trump Baby UK team who inspired us and so many others.So, we were pretty psyched when some folks contacted us saying that they'd commissioned a Baby Trump for us and it would be landing on our doorstep soon. Borrow this Imagery ! Expose the "Elephant in the Room"
This impressive inflatable fits in a large rolling suitcase and expands to be 12ft tall by 16ft long in less than 2 minutes. Rent or borrow this prop to point out in a big a way the Elephant in the Room issue that no one is talking about. Borrow this Imagery ! Sign Up Here to Bring This Criminal to your Town on the Impeach! Indict! Imprison Tour! Let's help Special Counsel Robert Mueller understand what We the People are demanding! Everyone who meets this guy will be happy for a chance to perform a Citizen's Arrest. Take your pick from the long list of arrestable offenses. Snap your pictures, then upload them to our site where we will forward your message to Robert Mueller. Resist Trump's assault on our liberties and society's slide towards tyranny. With the equivalent of a renegade corporation at the helm of the highest office in the land, we've got to pull out all the stops. It's time to Make This Head Roll! Borrow this Imagery ! Assert your campaign's moral leadership and broadcast your community's values with this massive and interactive prop. Borrow this Imagery ! Behold, a 3D, giant, inflatable, beautiful and highly detailed representation of big blue. This eye-catching imagery can be rented or borrowed for your community! Borrow this Imagery ! Rent or borrow this awesome, portable, compact, and lightweight pipeline prop that fully inflates in about a minute. Borrow this Imagery ! Fill out the quick form below to borrow or rent these props & imagery.